The Gods of Domino are hungry again... can you deliver? A Slice of Life is a full color 14 page introductory adventure for use with Murphy's World (or any other game system and/or Characters from any other roleplay game). This is a fast-paced adventure that while referencing some material from the Murphy's World book, such references are not critical and can be overlooked if you use this adventure with another game system. Adventure Premise: The people of Domino are in a panic. Generations ago, the original inhabitants cut a deal with the Gods — the Gods would refrain from destroying their village whenever they wanted some rough and ready amusement — and the townsfolk would produce a 'gourmet meal' whenever called upon. To demonstrate their sincerity the villagers scoured the land for the finest and rarest of ingredients so their bakers could produce an exotic 'pie'. This pleased the Gods greatly. Thus the Gods agreed to play a different game (everyone was getting into collector cards anyway) and destroy some other village; Domino would prepare a pie whenever called upon. Generations passed, and the Gods did not call. The villagers breathed a sigh of relief, believing the arrangement forgotten. Not so. Time moves differently for the Gods than for mere mortals. (For a start, Gods never get up before noon.) The day before the arrival of the Characters in the village, the Gods make a new request for the villagers to get baking, or they'll hold their Cosmic Domino Finals in the villagers' living rooms. Unfortunately, the villagers have a problem — they don’t have all the necessary ingredients. The village elders consulted ancient tomes, looking up the ingredients and where they could be found. They discovered there were many possible dangers to be encountered while gathering the ingredients. The elders decided the task was too dangerous to risk anyone they knew and cared for. They needed a group of schmucks to do the dirty work for them. That’s when the Characters arrive in town. This adventure includes numerous plot options, described NPCs, some handy GM reference tables and a Character Sheet that can be printed out for each player's Character. If your players are new to Murphy’s World, emphasize that the planet is not a typical roleplay setting. While the dilemmas, dangers, and rewards of adventure may prove just as valid and real as in any other setting, the motivations and actions of the characters encountered my prove to have their own (seemingly silly) logic; the unexpected occurs more often than the expected, reality tends to be elastic, and what may seem familiar at first glance is likely to have some unpredictable surprises. Above all, the most important thing is for everyone to have fun. 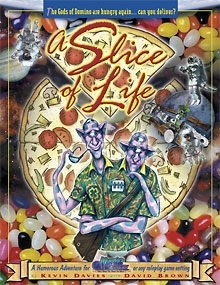 A Slice of Life can be read for amusement and/or used as a supplement for Murphy's World, a humorous techno-fantasy Roleplay Game available from Peregrine as a downloadable PDF for just $9.99. Murphy's World is a 163 page ebook that can be used as an adventure setting for characters from any RPG or as a stand-alone game (simple roleplay rules are provided based on a d100 percentile system). Please check it out by clicking on this link. This title was added to our catalog on February 10, 2011.